The Stride to Ride Musical Lion features two grow-with-me modes Encourage your child to use and strengthen developing gross motor skills! In walker mode, the easy-grasp handle allows your little tiger to stand and balance, and the wide wheel base can steady first steps. 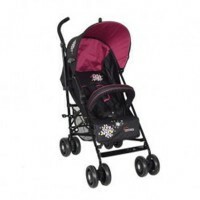 When they are ready to ride, the walker converts to a ride-on for roll-along fun. Whether walking, riding, or batting the roller bar on the tigers head, your little ones actions are rewarded with fun sounds and music!